The "assignment" in this case was not a blog post (although it has become, a blog post), but rather a cover illustration for a book. My old crony Charles produces an e-zine of speculative fiction called If-E-Zine (pronounced Iffy Zine). He was planning to compile some of his work into a book, and I offered my services for the cover. 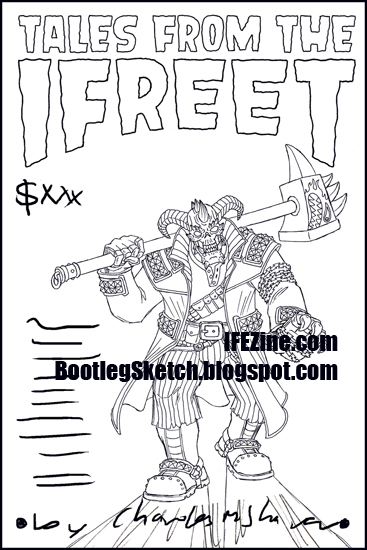 The cover was to feature the e-zine's mascot and sometimes 'host,' Iffy the Ifreet, a horn-mohawked, skull-faced demon, garbed in leather, chains and spikes (very metal). Charles has dressed as Iffy for Halloween a few times (link, link, link), but always with a slightly different appearance, so I was given free reign to come up with a unique character design, as long as I met the basic criteria. 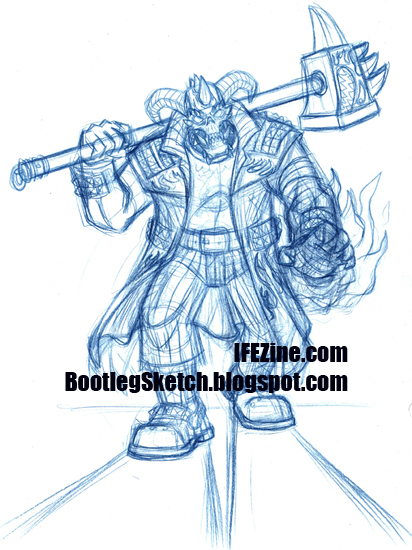 At this stage I'm just loosely sketching Iffy, figuring out what he's going to look like. Combining my favorite aspects of Charles' past Iffy Halloween appearances, I'm able to decide on the proportions of Iffy's face, and the configuration of his horns. 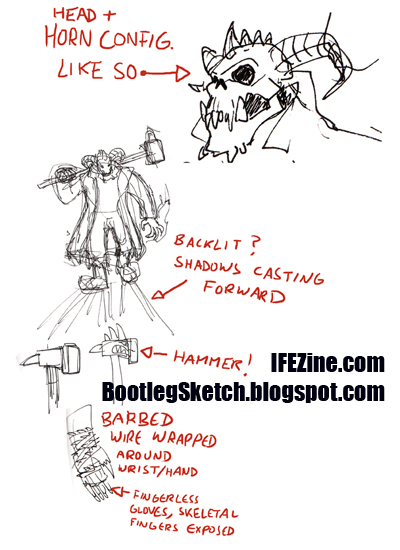 I sketch him with a powerful build, and very quickly I stumble upon what will become Iffy's pose for the final illustration--Iffy will be a menacing figure, stalking towards us, with a dangerous warhammer hefted over one shoulder, and a hand aglow with mystic fire. A character like Iffy should have a costume that isn't to symmetrical, but on the other hand, you want the elements to feel balanced so that no one area feels too busy or too bare. 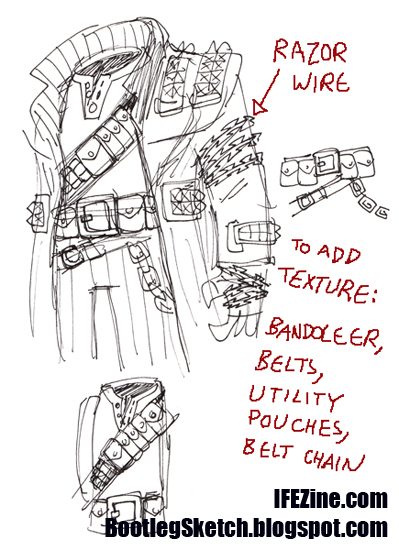 One of the changes I make here is to change the barbed wire to razor wire for a more streamlined visual read. 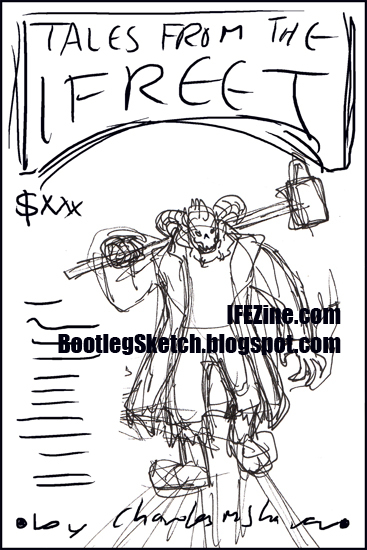 Not much to see here--I just take the rough pose that I've come up with, and put it in a template matching the dimensions for the cover, so that I can figure out how the type will match up with the illustration. This probably seems like a complex step, but once the costume details and pose are set, fleshing out the drawing is relatively straightforward. If you look carefully, you can see that I'm contemplating a flame pattern emblazoned on Iffy's coat, but I'm not crazy about how it's looking. Charles decides the flames on the coat are too busy, so the final version won't have them. When I finish the final inks, I scan them, clean them up in Photoshop, and place them in the rough cover layout. 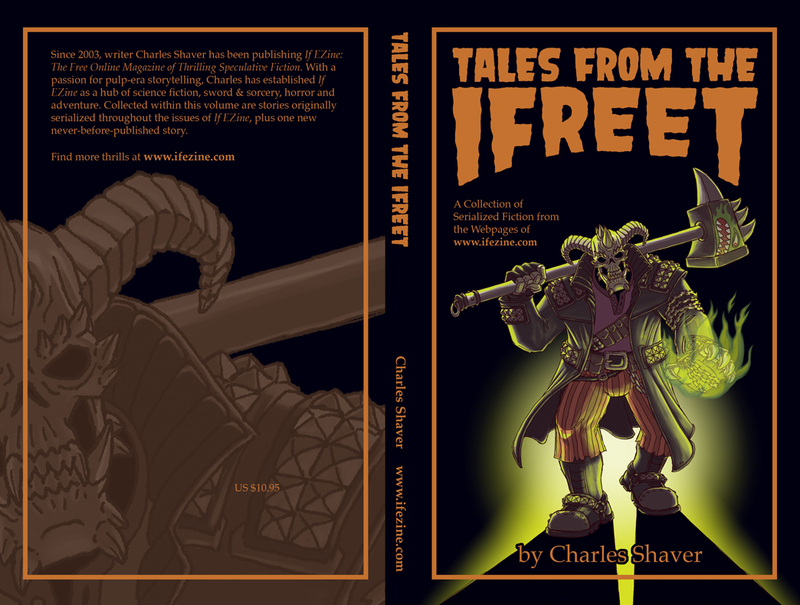 Charles wants a retro-horror-looking title font, so I research some, and hand-draw a treatment for the title. 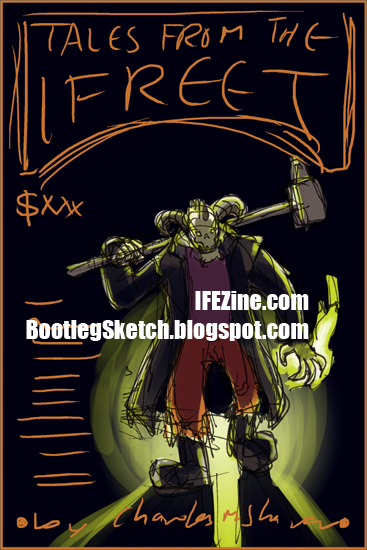 I place that in the rough cover layout as well, and now we've really got an idea of how the final piece is going to look. I might have mentioned never shut up about what a slow colorist I am, so for me, this step is particularly time consuming. Someday I'll make a step-by-step post about my coloring process, which is a whole thing unto itself, but for now I'll just give you the basics. Usually I just start slopping some colors around to nail down my color choices. Once I've got that figured out, I clean everything up. To keep things flexible for revisions, I tend to keep like-colors in separate layers, and give lighting effects (like the green flame and green highlights) their own layer as well. 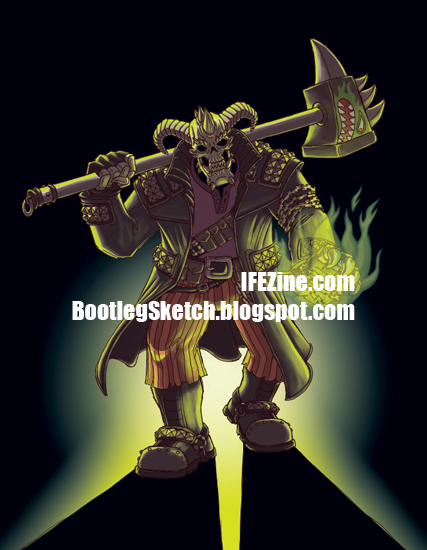 Color-wise, the important thing with this piece is the dramatic lighting created by the backlight and the green flame, so that's my focus as I bring this illustration to a close.